Just want to share you all this awesome event that POPSUGAR will be having. 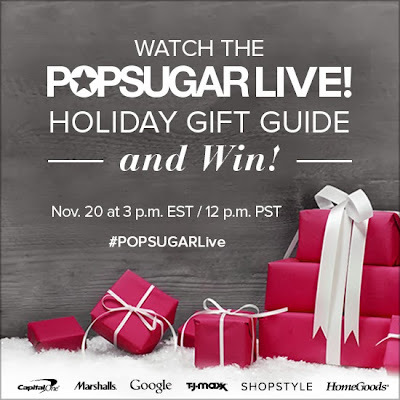 If you are still having troubles on what to get your Dad or Mom or Sister-in-law or cousin or co-worker I assure you POPSUGAR will have options for you on this live event. So go mark your calendars, set your alarm, go tell your friends as well and don't miss their live show! "For the third year in a row, we're bringing our amazing holiday gift guides to life with our 2013 LIVE Holiday Gift Guide show. To make the holidays even sweeter, we're also giving away some of the hottest items from our list. Watch as our POPSUGAR editors show off our favorite gifts for the season to help you with all your holiday shopping needs. Plus, we've made it easy to shop while you watch with direct links to purchase all the items. We'll also be giving away incredible items LIVE, so you won't want to miss it. Be sure to tune in to POPSUGAR.com on Wednesday, Nov. 20, at 3 p.m. EST/12 p.m. PST to discover our must-have gifts of the season and for your chance to win awesome prizes!"